Benefits of Grapefruit and its Part in Weight Loss | Eat Live to Thrive! I have known about the health benefits of grapefruit since I was a teenager. While I didn’t know why they were healthy, I did see the the benefits of grapefruit through my stepfather’s morning ritual. When I was growing up, I remember my stepfather getting a little heavy in the peak of his professional success, which led to some health issues. I listened to him complain that he was looking and feeling terrible, and that he was going to start changing things in his life so that he could get back to his normal healthy self. One of the things that I first noticed him doing, as I remember, was eating a grapefruit every morning and a bowl of oatmeal with skim milk on it. I was oblivious to ‘health issues’ being a part of my life since I was a competitive swimmer, surfer, martial artist, and all around extreme sports king of guy. I didn’t have but ounces of body fat, so I could never quite get my head around the idea that someone would allow themselves to get fat. It just didn’t register in my thinking that is was a normal thing, i.e. fatness. When my stepfather began his diet, I remember him telling me that exchanging out his typical eggs, bacon, biscuit sort of breakfast with something simple and nutritious like that of a red or pink grapefruit and oatmeal would help him lose weight and lower his cholesterol. I can’t remember why he said it would do that, but I do remember that it worked. Now that I am a sort of health fanatic and on a crusade to end diet-related obesity and chronic sickness in the world, learning the “why” and the “how” of the affects of certain foods on the body. Here is what I have found in my research about grapefruits. It is as my stepfather taught me, an ideal fruit for a weight-loss. It’s low in calories. A small grapefruit has 40 calories and a large grapefruit has 60 calories. Sixty calories is only 3% of your daily allowance. Grapefruits are most water, which is a major factor in cellular health. Red and pink grapefruit is filled with vitamins, minerals, and live enzymes which are invaluable to the health of your body on a cellular level. It’s loaded with Vitamin C (140% of your daily allowance). It has Vitamin A thiamin, riboflavin, niacin, b6, folate, pantothenic acid, calcium, magnesium, phosphorus, potassium, selenium, copper, manganese, and phytosterols. 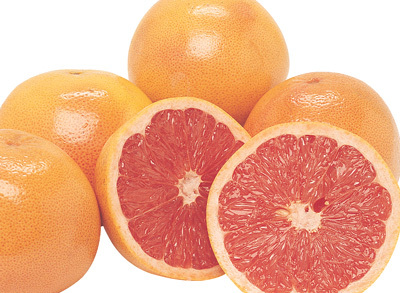 A grapefruit has 10% of your daily dietary fiber needs. Fiber is a huge contributing factor to weight loss and a healthy digestive track, and increasing your dietary fiber will leave you feeling fuller longer because it regulates how fast nutrients are assimilated into your blood stream. According to San Diego’s Scripps Clinic, grapefruit has a certain organic compound which acts as a mechanism to control insulin levels. As I have written about in other articles, insulin production promotes fat storage in your body. The ideal way to avoid weight gain is to regulate your insulin production. Grapefruits help significantly in making this possible. Simply eating grapefruit will not “make” you lose weight. Foods do not burn fat. It is what you choose to do each each day, i.e. remaining complacent and inactive versus an active lifestyle where you are burning calories through exercise. Weight loss is a product of your overall diet and lifestyle. If you want to lose weight, the idea is NOT to just stop eating, but to replace your high calorie diet with a low calorie diet, your cooked food diet that is high in carbohydrates, sugars, and fat, with a live (completely raw, if possible) food diet. Feed your body what it needs in nutrients (vitamin, minerals, enzymes, proteins, and healthy fats), and you will naturally lose unwanted pounds, have more energy, and think more clearly. If you are feeling a bit overweight and not liking that growing crop of cellulite that is collecting on your thighs, around your waist, and on your posterior, consider doing what my stepfather did – NOTHING drastic. A good starting point for lifestyle change: Change your morning meal to a grapefruit and small bowl of oatmeal (I like chopped walnuts, banana, cinnamon, and a few tablespoons of raw cold pressed coconut oil on mine – NO sugar or sweeteners). My stepfather lost about 50 pounds in a matter of six months by just making this simple change to his breakfast and adding a 20 minute walk in the morning and a 20 minute walk in the evening to his daily activities at the end of each day. Give it a try, see what you experience, and let me know. Absolutely wonderful article on the benefits of grapefruit for weight loss. As usual, you are giving such great information here. Thanks for your dedication to the health of others. I love your newsletter.